The leadership team at Churchill Downs is out to transform the historic racetrack into “Louisville’s ultimate nighttime hotspot,” according to Darren Rogers, senior director of communications at Churchill Downs racetrack. The numbers from special night racing events indicate that Churchill’s leadership is well on its way to achieving that goal. More than 28,000 people attended the first-ever Downs After Dark night-time horse racing event in June 2009. Each of the 17 night racing events since have averaged 25,000 attendees in the spring and summer, and 15,000 in the fall – consistently tripling the audience of the track’s afternoon racing program. Each Downs After Dark also sees double the afternoon races’ track wagering levels. The increases may be because of the unique mix of ingredients and patrons that night racing brings to the track. Company officials wanted to combine “Kentucky Derby and Kentucky Oaks’ cuisine, fashion, parties and great racing with an upscale night on the town,” Rogers said. Downs After Dark “appeals to core customers, the casual patron and an entirely new fan base: entertainment seekers,” he said. Rogers described Churchill Downs’ core customer as a “die-hard racing fan” who visits the track several times over the course of the meet. Horse racing tends to attract older people who have expendable time and income to use on the sport, he said. The casual customer is a horse racing fan or a fan of Churchill Downs who may visit on weekends or on special events, such as the Breeders’ Cup Parade of Champions that took place in November. The new fan base is a customer like Alicia Payne, a 23-year-old production drafter at Rainbow Design Services Inc. She frequents nightclubs, sporting events and concerts for her usual entertainment options, but gave Downs After Dark a try last year at a friend’s recommendation. She has not dressed up for any of Downs After Dark’s themed nights. The racetrack staff will choose a theme for the evening, set mood lighting from the Grand Stand, serve food and drinks related to the theme and encourage guests to dress up accordingly. Sunset hues set the tone for “Desert Oasis” one night this summer. Feathers, flappers and fedoras made a grand entrance during “The Golden Era” at the fall event on Nov. 17. Rogers is “thrilled” customers like Payne, who wouldn’t ordinarily go to Churchill Downs, are attending night races “because they become more familiar with our sport. (Night racing) exceeded our expectations, quite honestly, to have it grow this big, this quickly,” he said. The growth hasn’t been without challenges. They were understaffed at the first Downs After Dark in 2009 and had to offer make-goods on beverages for the next event. With only 4,600 parking spaces available on site, parking and traffic management require strategic planning. Papa John’s Cardinal Stadium offers race-goers free parking and shuttle service two hours before the first race, and the Louisville Metro Police Department manages traffic. 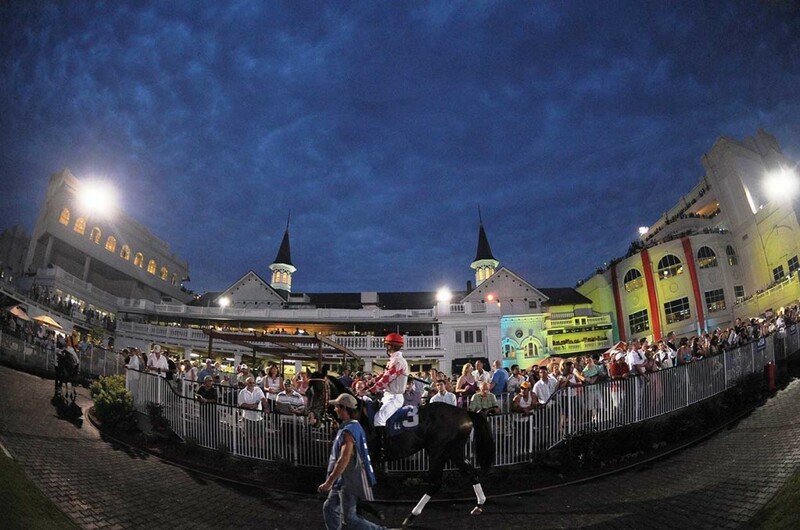 Churchill Downs intends to continue night racing. Opening night festivities will be Saturday, April 27, and Downs After Dark events are scheduled for June 15, June 22 and June 29. For ticket information, click here. Crews installed $4 million worth of permanent lighting in 2010 and some $9 million in upgrades began in August, when crews razed the track’s Paddock Pavilion, a 10,000-s.f. building known as the Churchill Downs Paddock from the 1920s to 1985. It was boarded up in the early 1990s when simulcast wagering was introduced and rarely has been used since then. Patrons now will be able to see a clear path to the horses in the paddock from the Gate 1 entrance. The new Paddock Plaza also provides an additional 30,000 s.f. of open gathering space. Construction on the Plaza Balcony concluded in November. The covered outdoor seating area – for special events such as the Kentucky Oaks, Kentucky Derby and select night racing events – has flat-screen televisions and ceiling fans. It seats up to 216 racing fans at tables and will give them the opportunity to see the jockeys walk through the room as they go to mount their horses. “It will be like a heavyweight title entrance come Kentucky Derby Day,” Rogers said. Special events aren’t entirely about bringing the Downs into Louisville’s night scene. The company is looking to the future, when the new generation of horse racing fans the track is cultivating through Downs After Dark and Friday happy hours will have the same time and money its current core customer does. large-screen televisions, food and bar service and a terrific vantage point for the viewing of pre-race activity in the Paddock during the track’s Spring and Fall Meet,” Rogers said. There’s also Churchill’s newest project, The Mansion. Started in August, this new opulent seating area for 320 invitation-only guests will occupy the sixth floor of the clubhouse, formerly the area known as the Media Center. The Mansion’s amenities will include a veranda, parlor, library, private wine cellar and personal concierge service. A modernized Media Center moved to the clubhouse’s first floor, where Churchill Downs’ General Offices were located until June. The Mansion and the Media Center will be completed in early 2013. For more information about Churchill Downs Racetrack, visit churchilldowns.com. Mariam Williams writes for BG Magazine. Interact with BG on Facebook at facebook.com/BGMag. Many Downs After Dark events have a theme. The racetrack staff sets mood lighting from the Grand Stand, serves food and drinks related to the theme, and encourages guests to dress up accordingly.